Glass whiteboards are more attractive and interesting to look at than typical dry-erase whiteboards. They can show your company logo, or a beautiful image, or anything else you have in mind. Turn them into calendars, schedules, sales charts—however you see fit. This will make your office or workspace look attractive to visitors without compromising function for your employees and for meetings. 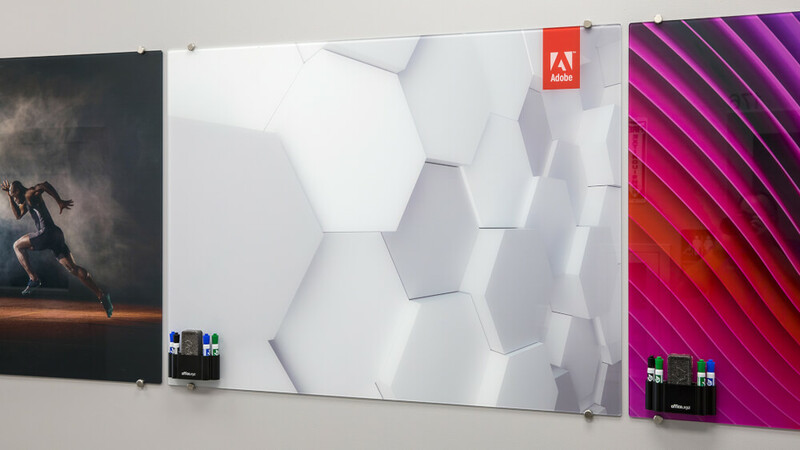 Our custom glass whiteboards have all the functionality of dry erase boards—they’re magnetic and easy to clean. And what’s more, they actually last longer than traditional whiteboards, and they don’t leave behind ghosting from markers. Also, you don’t have to worry that your whiteboard will be permanently damaged if someone accidently uses a permanent marker. On our custom glass whiteboards, permanent marker cleans right off with a little bit of alcohol. We can print anything you would like onto the glass. We recommend using images that are a little more simplistic with large areas where you can write. 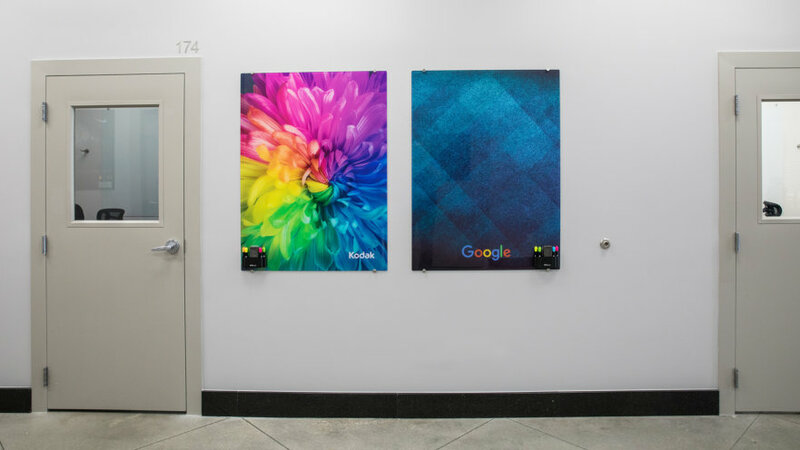 The alternative option is to have a series of boards mounted, with more complex imagery on the end boards and solid color boards in the middle. Whatever the chosen artwork, we will help ensure that the imagery is at least 400 ppi so that it looks crisp and clean when printed. The glass whiteboard can be mounted pretty much anywhere in your office or building. 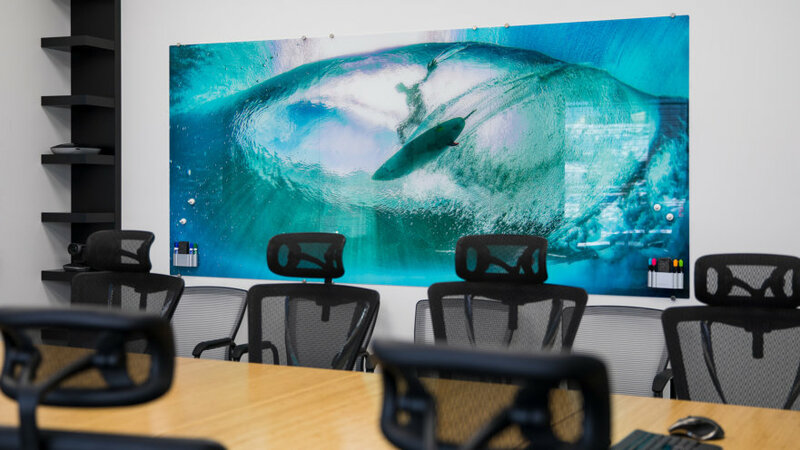 Since glass whiteboards are mounted using standoffs, the wall doesn’t need to be smooth or flat to mount one of our boards on it. Whether your walls are cement, drywall, plaster, or even brick, we can make the wall space functional for you. Use our custom glass whiteboards to turn any type of wall into a beautiful, writeable surface. Check out the work we’ve done for other glass whiteboard projects.